The following collections are available to travel to your college, school, museum, library, church or other institution. This exhibit consists of 16 mixed media collage quilts illustrating African American History events/periods accompanying poetry. This collection is in the book with the same title. The framed works are approximately 35 x 46. This exhibit and slideshow consists of 28 mixed media collage quilts on canvas illustrating African American History that includes a narrative describing the events. The works are 12 x 16. 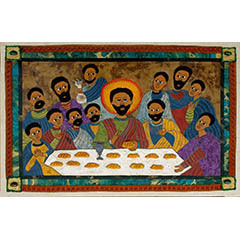 This exhibit consists of 23 mixed media collage quilts depicting the story of Jesus. The work is divided into 3 parts: Life events, (7) miracles, and “I Am” statements. This exhibit consists of illustrations of his poetry. The slideshow includes recitations of Hughes’ poems accompanied by the art of Robin J. Miller. 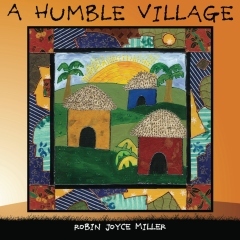 This exhibit consists of 12 mixed media collage quilts on canvas depicting the life in a Ugandan village. The slideshow is the book and background of the story with photographs of Ugandan children. Robin and her co-author/poet husband, James, conduct several presentations a year. This slideshow depicts an artist’s struggle from black shame to African American pride through art and poetry. It includes slavery, the Civil Rights Movement, and Racial Harmony. – This can also include a short poetry slideshow introducing the topic of White Privilege. The poem is entitled Never Had The Privilege. This slideshow takes the viewer through poetic and artistic journey from slavery to presidency. This slideshow presents most of the work in the book. 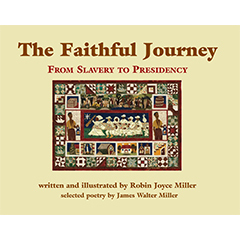 This slideshow takes the viewer on a pictorial and chronological journey of African American history from slavery to presidency (prose, not poetry). This slideshow takes the students on a journey from the Great Migration to the Harlem Renaissance. 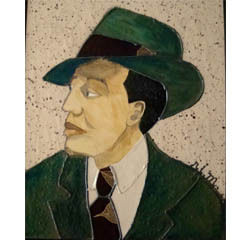 Students will view RJ Miller’s art depicting the Harlem Renaissance and listen to a poem by Langston Hughes. This slideshow reflects African American life through the poetry of Langston Hughes and the art of Robin J. Miller. This slideshow explores the jazz-related work of master artists including Faith Ringgold, Henri Matisse, William H. Johnson, Pablo Picasso, Jackson Pollock, and Romare Bearden. Visual imagery, poetry and a jazz performance on film create an exciting experience for students.